Motorola is making a play for mobile ticketing and coupon scanning solutions, and their DS9208 barcode scanner is another step toward that end. More people are getting coupons and tickets sent to their smartphones, iPads, and so scanners need to be modified to read them quickly and effectively. The DS9208 follows a similar build style to the LS9208, so it doesn’t take up too much space at your counter or checkstand. It looks a little bit like a power droid from Star Wars, which I’m told has a posse. Anyway, the DS9208 offers 1D and 2D scanning, with a scan range of about 10 inches, which is pretty good for a 2D presentation scanner. Scanning speed is a little tuned down compared to their higher end 2D scanner, the DS9808, and I think that’s to maintain accuracy. It’s also still able to catch a barcode zipping by at 90″ per second, which is a little over 5 mph, and probably faster than most people would try to swipe a barcode past it. Unlike boring paper-based barcodes, barcodes on smartphones, mobile computers, or other LCD screen type things end up catching a lot of glare. It’s bound to happen when there’s a piece of glass on top of your barcode. Kind of a bummer, but Moto’s got a solution. The viewing lens on the DS9208 is spherical instead of a flat piece of plastic, minimizing glare from smartphone screens when scanning, and potentially speeding up the barcode scanning process. It’s become pretty standard among 2D scanners, but the DS9208 has models available that can parse driver’s license data, reformat it, and send it in the order you prefer. So Target, with their credit application process, or any grocer ever with their customer loyalty program, can scan a customer’s license and enter the data immediately and accurately, as opposed to hand writing the content, then manually entering it, and turning 743 Evergreen Terrace into 148 Fevergen Trace. If mobile ticketing gets as big as everyone says, the last thing a passenger will want is to have to wait while someone futilely tries to scan the ticket on their phone. The DS9208 should definitely alleviate those headaches. Because the last thing I want to do while waiting for a flight is wait some more. 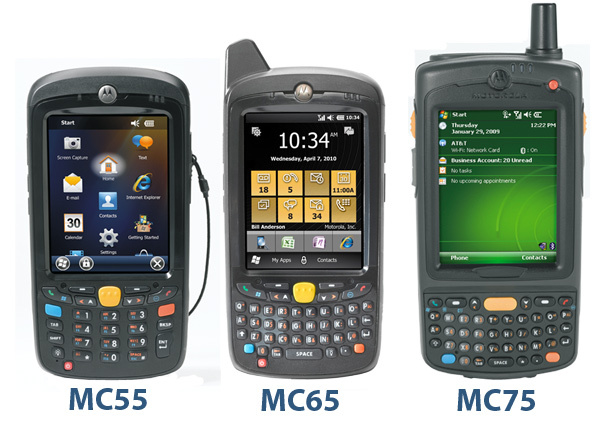 In the past couple years, Motorola’s moved from the very different MC50 and MC70 mobile computers, now offering the MC55, MC65, and MC75. And while they look relatively similar, there’s a bigger difference between them than one being ten more than the other. MC55: The MC55 is kind of the entry level mobile computer in terms of features, but is still a great fit for inventory management or data collection “within the four walls.” I’m really feeling comfortable with corporate jargon, so to translate, the MC55 has WiFi and Bluetooth communications capabilities, but lacks cell phone radios. You also get the option of the laser barcode scanner or the 2D imager, so you can trim down costs by getting a unit that just has what you need and that’s it. There’s also an optional camera if you happen upon the ultimate there I fixed it situation and must capture it. MC65: Of the three, the MC65 is the most versatile. You get the Bluetooth, you get the WiFi, but you also get a soft-switch cellular radio in there. So you can switch between CDMA or GSM networks without having to swap cards or reboot the mobile computer. Now even if you’re in the boonies, you have a good chance of getting enough bars to order a pizza. The MC65 is a little stronger than the MC55 as well, able to survive bigger drops and dirtier environments. You also get a faster processor and more RAM, so loading apps or searching databases is a little snappier. These units all come with the Blockbuster 2D imager, which I’ve mentioned as being the bee’s knees previously. 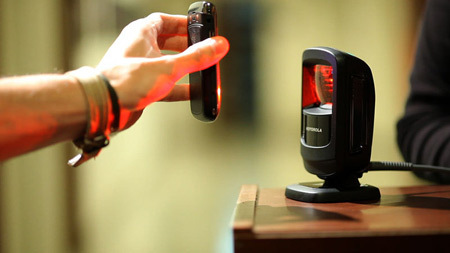 It’s a fast scanner, I can see why it’s going into most of Motorola’s new products. MC75: As the beastly big brother of the lineup, the MC75 beats out the other two in terms in of raw performing power. You can get a cell phone radio in the MC75, but unlike the MC65 you have to choose a single network. Like the MC55, the MC75 comes with either a 1D laser barcode scanner or blockbuster 2D imager built in, and the option of a camera. The wide variety of MC75 options lets you pick the model that has the features you need & little else, saving you some cash. Here’s a quick breakdown of the major differences between the product lines. So not only is the MC75 twenty better than the MC55, it’s better suited for high demand computing, field mobility, and applications that have very specific requirements. The MC65 is the one-size-fits-all option for mobile computing, and the MC55 fits at home within your business for data capture.